Car Shows, Katy Perry, Art Exhibits: What’s Going on at the New Vibiana? For 118 years, the Cathedral of Saint Vibiana at the corner of Main and 2nd in downtown served as the seat of the Los Angeles Roman Catholic Archdiocese. After it was severely damaged during the 1994 Northridge earthquake, a lengthy battle between preservationists and the Church ended with the archdiocese moving into new digs at the Cathedral of Our Lady of the Angels on Temple Street in 2002. Following an extensive renovation, Vibiana was sold to downtown developer Tom Gilmore in 1999 and has hosted private and public events since the late 2000s, which is where Amy Knoll Fraser comes in. 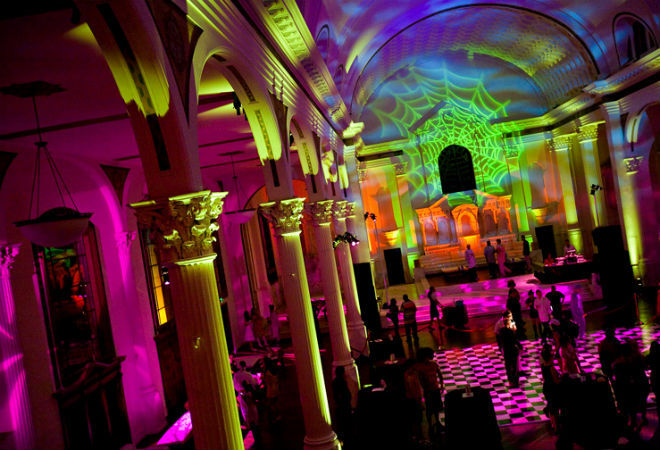 “I fell completely in love with Vibiana when we catered an event here in 2008,” says Amy Knoll Fraser. In late 2012, she and her husband, chef Neal Fraser (BLD, Fritzi Dog, Grace), took over management of the 138-year-old building, aiming to turn Vibiana into a full-service event space with an adjoining restaurant, Redbird, in the church’s old rectory. Recipe: Is That a Carrot, or is Chef Neal Fraser Happy to See Me? For Knoll Fraser, it’s also a chance to realize her long-held dream of using the event space to showcase art. “I’ve always thought the main hall of the old cathedral would make a stunning stage for an art exhibit,” she says. The new exhibition series debuted on January 20 with works by Nancy Baker Cahill and Yuval Pudik. “When I came across Nancy Baker Cahill’s work, I was taken with her large five-by-five foot drawings. I knew they would look great in the space.” Israeli-born artist Yuval Pudik’s works will take advantage of the main hall’s unique lighting and openness. In the next phase of the revamp, Knoll Fraser and her husband hope to activate the second floor of the rectory. They currently use the third floor as an office space, the fourth floor, which was once the cardinal’s suite, as a VIP lounge or the bridal suite for weddings. On the second floor, they plan to install private dining rooms for Redbird complete with its own bar, lounge area, and terrace overlooking the courtyard. When: January 20 – 30 (By appointment). Opening reception: January 26, 6 p.m.